Joseph "Jeph" Loeb III is an American comic book writer, screen and television writer as well as television and motion picture producer. A three-time Eisner Award Winner and five-time Wizard Award Winner, Loeb has found tremendous success at both Marvel and DC where he has written stories with such diverse characters as the X-Men and Superman as well as Batman and Spider-Man. He is known for his excellent grasp of characters personalities and extensive use of narration boxes as monologues to reveal the inner thoughts of said characters. His most celebrated works have been with his long-time collaborator Tim Sale, specifically the "Year 1"-centered Batman: The Long Halloween, Batman: Dark Victory, and Superman For All Seasons. 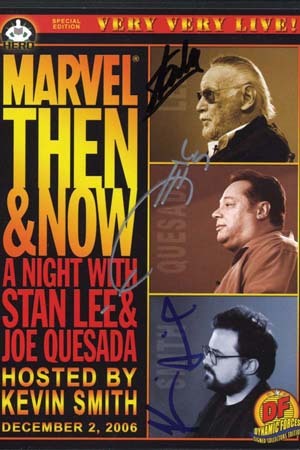 THE HERO INITIATIVE "A NIGHT WITH STAN LEE" - SIGNED BY STAN "THE MAN" LEE MODERATOR KEVIN SMITH AND MARVEL EDITOR-IN-CHIEF JOE QUESADA! In 2003, Loeb teamed with artist Jim Lee to create the year long mystery Batman: Hush, the highest selling DC comic in over 10 years. Hush, which spawned three lines of toys, posters and calendars, sat at the #1 spot for eleven of the twelve months it was in publication. The following year, Loeb launched Superman/Batman which toppled Hush's success, featuring artists such as Ed McGuinness, Michael Turner, Pat Lee, Carlos Pacheco and Ian Churchill. In 2005, Loeb spun Supergirl out of Superman/Batman with artist Ian Churchill. Jeph Loeb was a writer and supervising producer for Smallville and Lost. In 2006, he became Co-Executive producer and a writer for the NBC drama Heroes, which features art by Tim Sale. After only eleven episodes, Heroes was nominated for 2 Golden Globes and a Writer's Guild of America award for Outanding New Drama. The show won The People's Choice Award for Best New Drama and an AFI award for one of the Top Ten Television Programs in 2006. He was born in Stamford, Connecticut. He reportedly read his first comic book during the summer of 1970. By winter of the same year, Jeph was apparently fascinated enough to convince his father to purchase the comic book collection of one Tom Chicarella on his behalf. Tom was from Brooklyn, New York and the sold collection reportedly included every issue published by Marvel Comics between 1961 and late 1970. His later step-father was a vice-president at Brandeis University, Waltham, Massachusetts, where Jeph met one of his mentors and greatest influences in comic book writing, the legendary Elliot Maggin. Jeph however attended Columbia University. He graduated with a Bachelor of Arts and a Master's degree in Film. His instructors included MiloÅ¡ Forman and Paul Schrader. His debut in film-making was his collaboration with Matthew Weisman in authoring the script of Teen Wolf. The film was released on August 23, 1985 and was a notable starring role for Michael J. Fox. Loeb and Weisman then collaborated in writing the script of Commando. The film was released on October 4, 1985 and starred Arnold Schwarzenegger. His next screen credit was the film Burglar, first released on March 20, 1987. The plot was based on the novels of Lawrence Block about fictional burglar Bernie Rhodenbarr. His collaborators were Weisman and Hugh Wilson. The film was atypical for the time, featuring a tough-woman comedic role for starring actress Whoopi Goldberg. His second film that year was Teen Wolf Too, a sequel of Teen Wolf. His co-writers were Weisman and Tim Kring. The film was released on November 20, 1987. The film featured teen idol Jason Bateman and veteran actor John Astin. Loeb would reteam with Kring almost two decades later for the TV series Heroes. Four years later, Loeb was working on a script for The Flash as a feature with Warner Brothers. While the script deal fell through, Loeb met then publisher Jenette Kahn who asked Loeb to write a comic book for DC. In 2002, Jeph Loeb wrote the script for the popular episode of Smallville, entitled "Red", which introduced Red Kryptonite into the series. He became a supervising producer, and has written many episodes since then. In their second season, Jeph Loeb became a supervising producer of the ABC TV show Lost. Leaving Lost, Loeb went on to become Co-Executive Producer and writer on Heroes, the breakout hit on NBC. Jeph Loeb's first comic work was Challengers of the Unknown vol. 2 #1 - #8 (March -October, 1991). The mini-series also featured notable guest appearances by Doctor Fate (Eric and Linda Strauss), Batman, James Gordon, Guy Gardner and Lois Lane. Most notably, it was the first of many collaborations with Tim Sale. Jeph's most famous comic work is the Batman graphic novel The Long Halloween, a 13-issue limited series set in "Year One" which he collaborated with Tim Sale. The book is considered to be one of the best Batman stories ever, and is frequently recommended as an Essential piece of the Batman mythology. The Long Halloween was one of the 3 noted comics that influenced the recent Batman Begins, the others being Batman: The Man Who Falls and Batman: Year One. Jeph was also recruited as a writer and supervising producer for the hit show Smallville for a number of seasons (2002-2005). Given his familiarity with the Superman mythos and experience with writing the character in comics, he lent a continuity and authenticity to the show that comic fans seem to appreciate. Most recently, he joined the writing staff of the popular ABC series Lost as a supervising producer before moving to NBC to work with his old collaborator, Tim Sale, on the 2006 series, Heroes. Jeph's son, Sam Loeb, died on June 17, 2005 at the age of 17 after a three-year long battle with cancer. At the age of 15, Sam wrote a story in issue 5 of the Tales of the Vampires comic series with Jeph's long-term collaborator Tim Sale. In 2006, Sam's final work appeared in Superman/Batman #26, which was nearly completed before his death. His father finished the work with the help of 25 others, mostly considered legends within the comic book industry, and all of whom were friends of Sam, including Art Adams, Joe Casey, John Cassaday, Joyce Chin, Ian Churchill, Allan Heinberg, Geoff Johns, Joe Kelly, Mike Kunkel, Jim Lee, Pat Lee, Rob Liefeld, Paul Levitz, Joe Madureira, Jeff Matsuda, Ed McGuinness, Brad Meltzer, Carlos Pacheco, Duncan Rouleau, Tim Sale, Richard Starkings, Michael Turner, Brian K. Vaughan, Mark Verheiden, and Joss Whedon. The issue also featured a tale titled "Sam's Story," dedicated to Sam. Also in 2006, it was Jeph who chose his hometown of Stamford, Connecticut to be subject to superhero destruction in the opening issue of Marvel's currently on-going crossover event, Civil War. Loeb currently shares his writing studio, The Empath Magic Tree House, with Geoff Johns and Allan Heinberg.